Can Therapeutic Drug Monitoring with Monotherapy Achieve Similar Results as Combination Therapy for IBD? A recent retrospective study (S Lega et al. 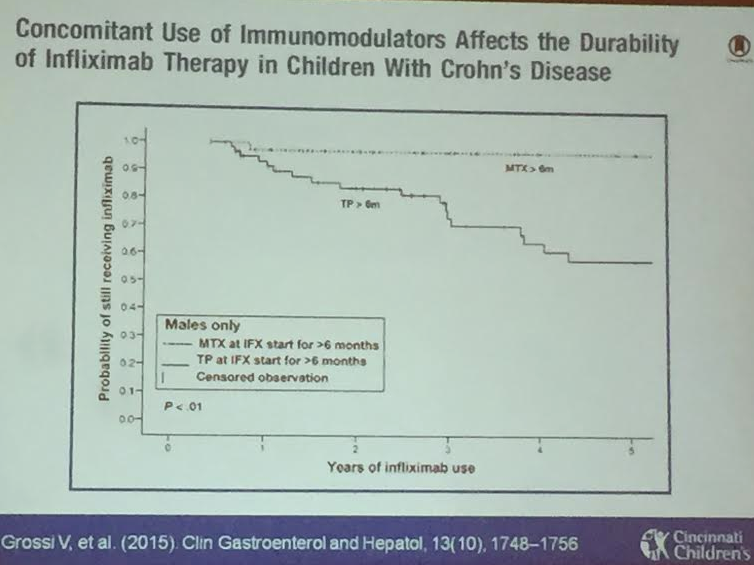 Inflamm Bowel Dis 2019; 25: 134-41) suggests that proactive therapeutic drug monitoring (pTDM) with infliximab (IFX) helps achieve similar outcomes as combination therapy (with immunomodulator) in patients with inflammatory bowel disease. The study enrolled 83 patients; only 16 received were in the monotherapy pTDM group. The authors utilized TDM at week 10. If the IFX level was <20 mcg/mL, the dose and frequency of infliximab were both adjusted. 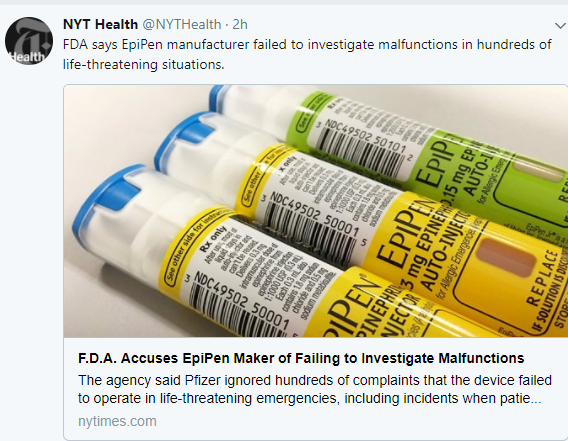 If the level was between 20 & 25, either the frequency was adjusted or no adjustment, and if the level was >25, then no adjustment in dosing was performed. In the discussion, the authors suggest that week 14 TDM may be suboptimal as this is the first time patients have an 8-week interval. Vitamin D Receptor Signaling in IBD. Inflamm Bowel Dis 2018; 24: 1149-54. This article reviews the ways vitamin D/vitamin D receptor may contribute to the genetic, environmental, immune, and microbial aspects of IBD. LY Chi et al. Inflamm Bowel Dis 2018; 24: 1344-51. This study with 223 pediatric patients & young adults found that current or prior combination therapy with infliximab, compared to monotherapy resulted in higher infliximab levels and lower antibody formation. Combination agent was mainly methotrexate (n=71) rather than thiopurine (n=13). In those with infliximab dose <10 mg/kg, those currently receiving combination therapy had median level of 11.1 compared with 7.0 for prior combination and 5.86 for monotherapy (never combination). CM Johnson et al. Clin Gastroenterol Hepatol 2018; 16: 900-7. In this retrospective study with 1466 patients with Crohn’s disease, the subset of patients with granulomas (n=187, 12.8%) were associated with a more aggressive phenotype and a younger age at diagnosis (23.6 years compared with 27.9 years; P= .0005). These patients had higher rates of steroid use, narcotic use, more stricturing and penetrating disease along with increase rates of surgery. K Watanabe et al. Clin Gastroenterol Hepatol 2018; 16: 542-9. The DIAMOND study evaluated monotherapy with adalimumab (n=85) compared with combination therapy of adalimumab with azathioprine (n=91). 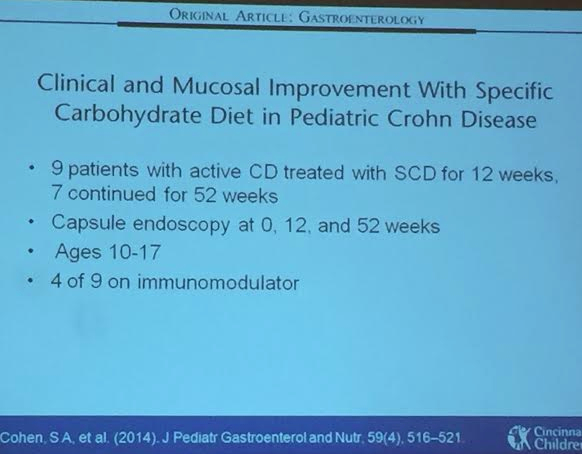 In this subanalysis of patients with moderate and severe Crohn’s disease (CD), endoscopic response (defined by SES-CD drop of at least 8 points or SES-CD <4) was significantly higher at week 26: 71.6% vs 54.4%. The OR for endoscopic response was 2.12 at week 26 with combination therapy. At week 52 the endoscopic response difference was not statistically significant: 60% vs. 50%. Similarly, mucosal healing was more common (but not statistically significant) in the combination group compared with monotherapy: 20.9% vs 103% at week 26, and 21.5% vs 12.2% at week 52. While not statistically significant, the combination group had ADA trough that was higher (7.6 compared with 6.5). My take: The results described above for endoscopic responses and mucosal healing rates are depicted in figure 2 (I do not have a digital copy of figure or permission to use). After one looks at this figure, depicting the data noted above, there certainly appears to be an advantage for the use of combination therapy in patients with moderate-to-severe CD. Combination Therapy with Adalimumab: Is It Helpful? Combination Therapy with Adalimumab -Is it Helpful? A recent study (JM Chalbhoub et al. 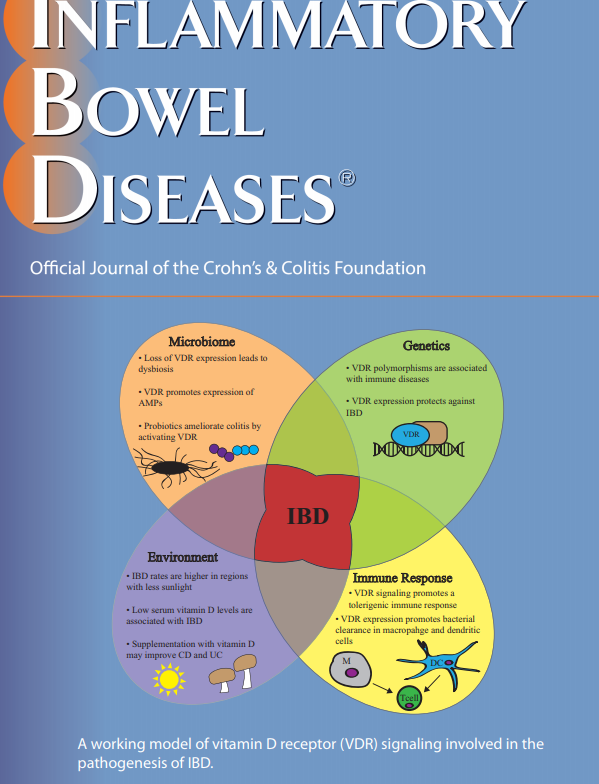 Inflamm Bowel Dis 2017; 23: 1316-27) performed a systematic review and meta-analysis to examine the effectiveness of Adalimumab (ADA) combination therapy compared with monotherapy. 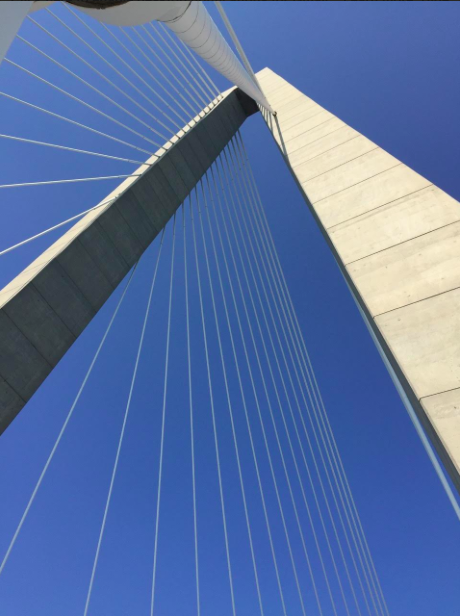 With infliximab (IFX), the SONIC study, showed that combination therapy with an immunomodulator (IMM) (azathioprine) improved response; combination therapy resulted in reduced immunogenicity, lower rates of infusion reactions, and higher IFX levels. 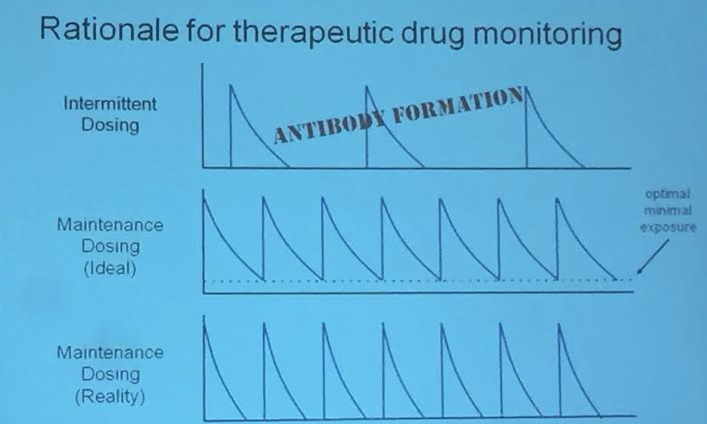 With the advent of widespread use of therapeutic drug monitoring, some have questioned the need for combination therapy with IFX. The need for combination therapy for ADA is also a matter of debate. ADA has less immunogenicity than IFX and it is unclear if combination therapy will improve outcomes. There have been conflicting studies regarding combination therapy with ADA, prompting the current meta-analysis. No significant difference between combination therapy and monotherapy was noted for induction of remission (OR 0.86) or response (OR 1.01). The induction of remission is based on data from 3096 patients (1400 on combination treatment). No difference was noted for maintenance of remission (OR 0.97) or response (OR 0.91). The maintenance of remission is based on data from 1885 patients (859 on combination treatment). 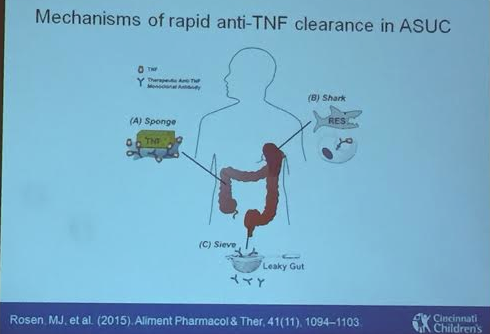 Overall, the authors conclude that “combination of ADA and immunomodulators does not seem superior to ADA monotherapy for induction and maintenance of remission and response to Crohn’s disease.” They do comment on the recent DIAMOND study which was a randomized open-label top-down strategy trial in anti-TNF-naive and IMM-naïve patients. While no overall advantage of combination therapy was evident, better endoscopic response (84% vs. 64% with monotherapy) was seen at 26 weeks (but not at 52 weeks). This study has several limitations. Overall, there were a small number of randomized trials and the trials had significant heterogeneity. In those (in sustained deep remission) with an infliximab trough level >5 mcg/mL, this algorithm recommends discontinuation of thiopurine. In those with an infliximab trough level 3-5 mcg/mL and with 6-TGN >250, this algorithm recommends reduction of thiopurine to obtain 6-TGN level >125. In those with an infliximab trough level <2 mcg/mL and with 6-TGN >250, this algorithm recommends discuss stopping infliximab. 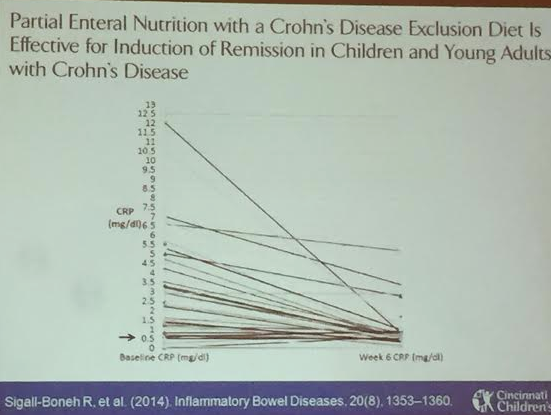 My take: Until more studies emerge, the best way to balance control of IBD and minimize drug toxicity remains uncertain. 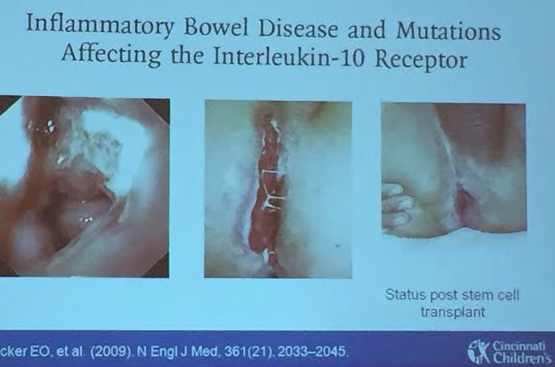 “Crohn’s disease of the ileoanal pouch” AL Lightner et al. Inflamm Bowel Dis 2016; 22: 1502-8. SZ Koh et al. Inflamm Bowel Dis 2016; 22: 1397-1402. 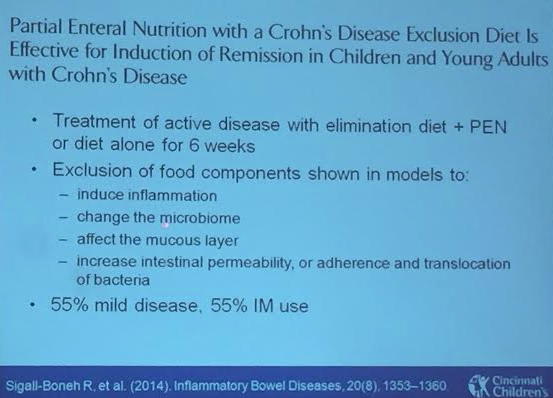 This reference describes clinical factors associated with development of Crohn’s disease in patients with IBDU who have undergone ileal pouch (e.g. younger age). This blog entry has abbreviated/summarized this terrific presentation; most of the material has been covered in this blog in prior entries but still this was a useful review. Though not intentional, some important material is likely to have been omitted; in addition, transcription errors are possible as well. I really enjoyed meeting Dr. Rosen. He is super-friendly and knowledgeable. Combination therapy. Grossi V et al showed improvement in infliximab durability with concomitant therapy. 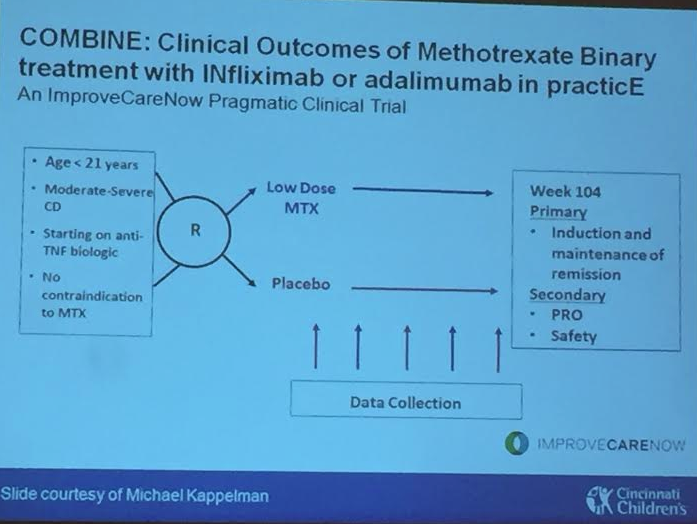 Now starting COMBINE trial (ImproveCareNow)–randomized to low dose MTX or placebo in combination with anti-TNF agent. Therapeutic drug monitoring in pediatrics. 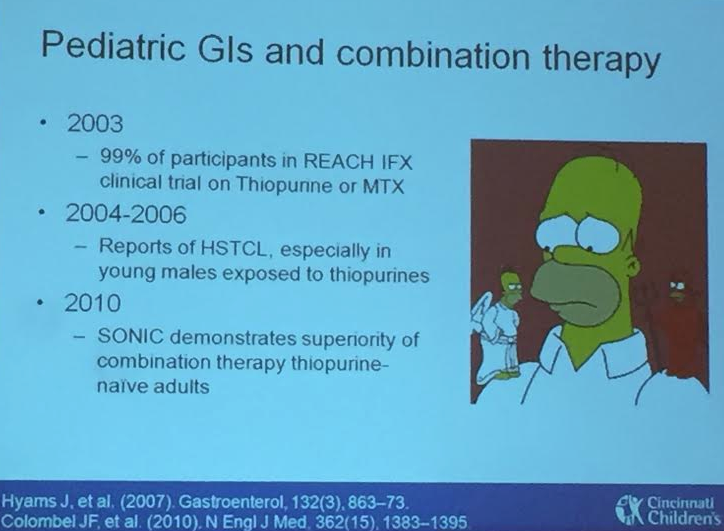 Is this an alternative to combination therapy? Rationale (see slide): lower antibody formation if trough levels maintained. 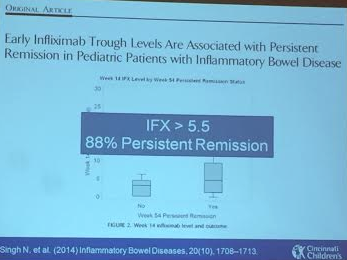 IFX level >5.5 associated with persistent remission (Singh et al 2014). Children are growing and they may need more adjustments. In Cincy, checking levels at week 14 after initiation and then every 6-12 months. 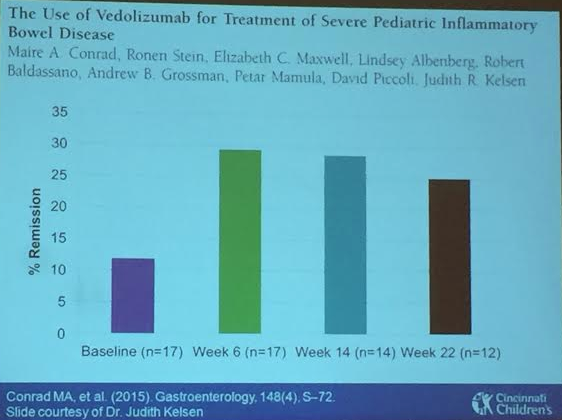 Vedolizumab. Conrad MA 2015. About 1/3rd of these refractory patients in this abstract responded. Ustekinumab . IL-12 & IL-23 blockage. No studies in pediatrics. Case report reviewed of good response in a refractory case. Enteral therapy. Specific carbohydrate diet experience. These diets have some published data, most retrospective studies. Our group (Cohen SA et al) did perform a small prospective study. 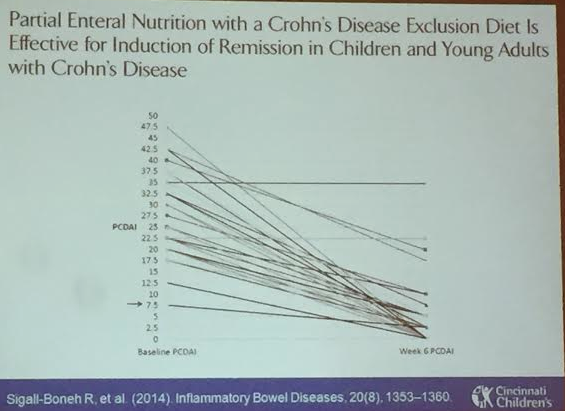 Sigall-Boneh R et al showed improvement with partial enteral nutrition. Very early-onset of IBD. IL-10 receptor deficiency was a key early discovery and can be treated with stem cell transplant. STAT3 mutation case reviewed which was managed with tocilizumab. More targeted therapy expected based on specific mutations. 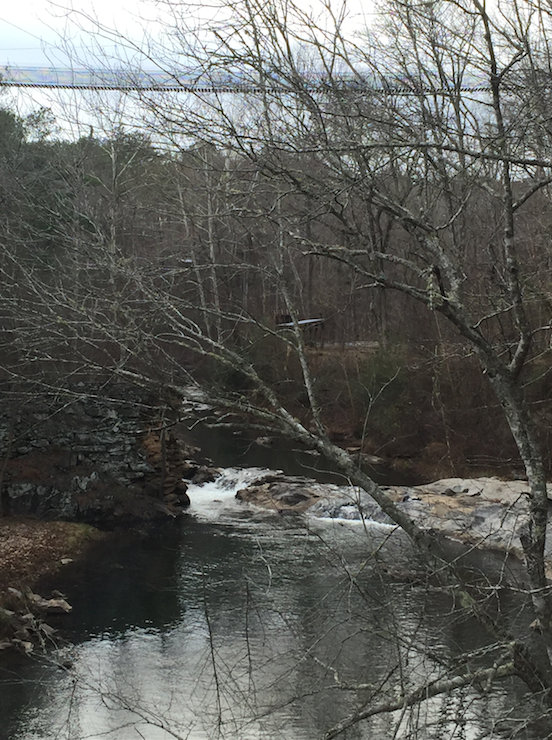 Should Methotrexate Be Used For Ulcerative Colitis? 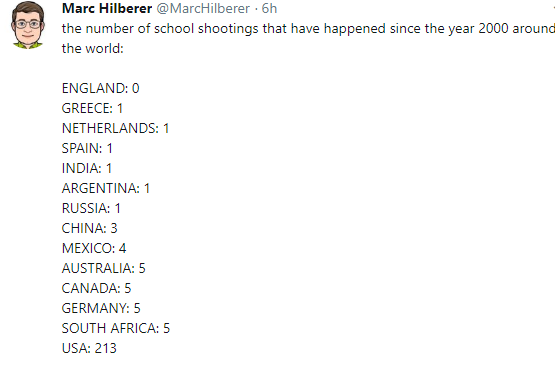 A recent study (F Carbonnel et al. 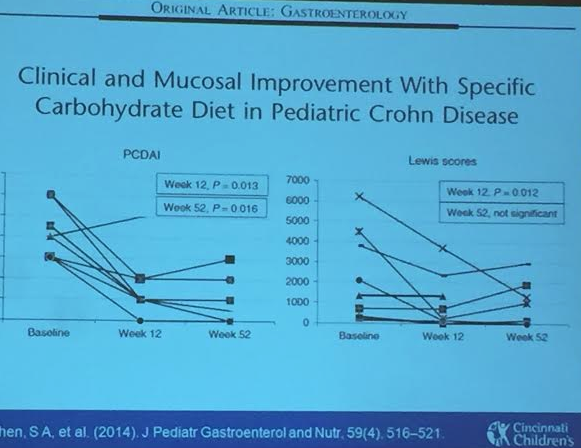 Gastroenterol http://dx.doi.org/10.1053/j.gastro.2015.10.050, article in press; thanks to KT Park twitter feed for reference) with 111 patients provides more questions than answers. It appears that methotrexate improved clinical remission but the overall difference is fairly small; the abstract is below. 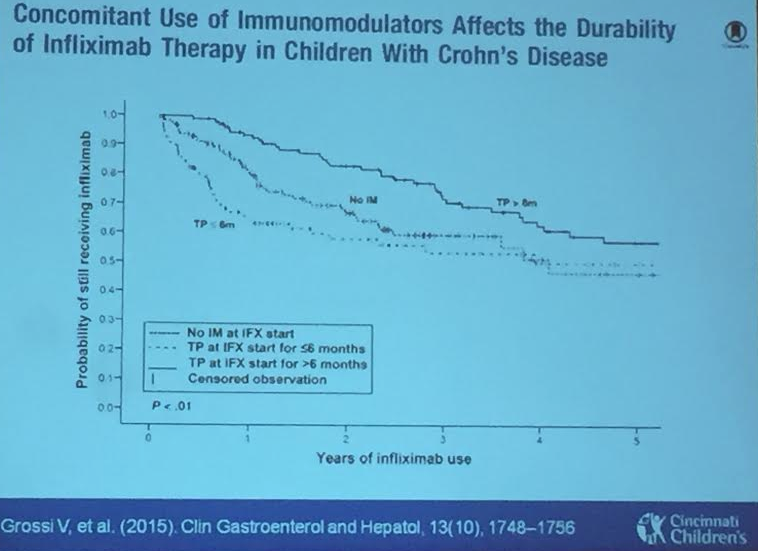 My initial impression: Immunomodulators (including methotrexate and thiopurines) have some efficacy as monotherapy agents in patients with inflammatory bowel disease. Their role as part of combination therapy (with anti-TNF agents) has been associated with improved outcomes but how long to use combination therapy and at what dosage is still being worked out. 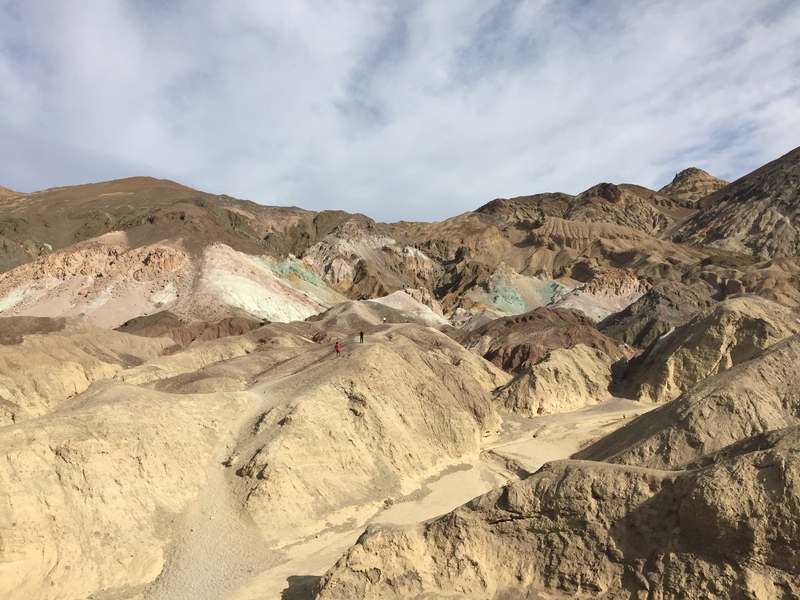 Parenteral methotrexate is an effective treatment for patients with Crohn’s disease but has never been adequately evaluated in patients with ulcerative colitis (UC). We conducted a randomized controlled trial to determine its safety and efficacy in patients with steroid-dependent UC. We performed a double-blind, placebo-controlled trial to evaluate the efficacy of parenteral methotrexate (25 mg/week) in 111 patients with corticosteroid-dependent UC at 26 medical centers in Europe, from 2007 through 2013. Patients were given prednisone (10 to 40 mg/day) when the study began, and randomly assigned to groups (1:1) given placebo or methotrexate (intramuscularly or subcutaneously, 25 mg weekly) for 24 weeks. The primary endpoint was steroid-free remission (defined as a Mayo score ≤ 2 with no item > 1 and complete withdrawal of steroids) at week 16. 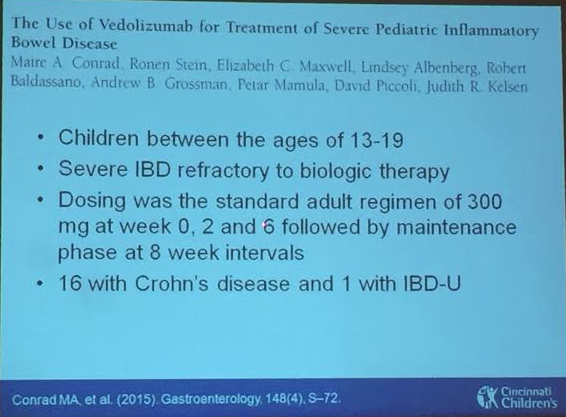 Secondary endpoints included clinical remission (defined as a Mayo clinical subscore ≤ 2 with no item > 1) and endoscopic healing without steroids at weeks 16 and/or 24, remission without steroids at week 24, and remission at both weeks 16 and 24. Steroid-free remission at week 16 was achieved by 19/60 patients given methotrexate (31.7%) and 10/51 patients given placebo (19.6%)—a difference of 12.1% (95% confidence interval [CI], –4.0% to 28.1%; P=.15). The proportions of patients in steroid-free clinical remission at week 16 were 41.7% in the methotrexate group and 23.5% in the placebo group, for a difference of 18.1% (95% CI, 1.1%–35.2%; P=.04). The proportions of patients with steroid-free endoscopic healing at week 16 were 35% in the methotrexate group and 25.5% in the placebo group—a difference of 9.5% (95% CI, –7.5% to 26.5%; P=.28). No differences were observed in other secondary endpoints. More patients receiving placebo discontinued the study because of adverse events (47.1%), mostly caused by UC, than patients receiving methotrexate (26.7%; P=.03). A higher proportion of patients in the methotrexate group had nausea and vomiting (21.7%) than in the placebo group (3.9%; P=.006). In a randomized controlled trial, parenteral methotrexate was not superior to placebo for induction of steroid-free remission in patients with UC. 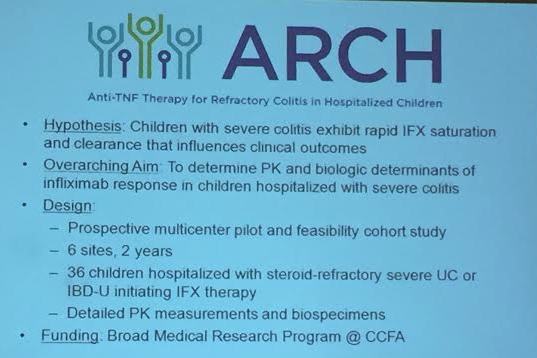 However, methotrexate induced clinical remission without steroids in a significantly larger percentage of patients, resulting in fewer withdrawals from therapy due to active UC.